From a financial point of view, the average UK household apparently spends about £100 per year on batteries. All of this means it makes sense in both environmental and financial terms to try to use less. These four products will help you do just that. They are ideal either as gifts or for your own use and use a variety of methods such as solar, wind up or pedal power to help reduce reliance on disposable batteries. Have you ever had a TV remote control run out of batteries? You go to the draw or the cupboard and realise you don’t have any spares left? Such is our reliance on remote controls these days that it can be more than just inconvenient, it can be that your television can’t be operated without it. With this solar powered TV remote you need never worry about it again. Its lithium ion battery can be charged by artificial though it is better in direct sunlight. Just leaving it on a window sill that gets some sun through the day, say while you’re at work, should do the trick (you don’t need to leave it outside). It should work with most TV models and you’ll never have to buy another TV remote battery again. 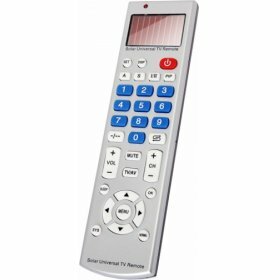 It has 34 different button functions so should be able to do everything your current TV remote can do. This remote is available for the bargain price of £9.99, so it won’t take long to pay for itself in terms of saved batteries. What do you get if you cross keep fit with energy saving? The Cougar pedal powered charger! 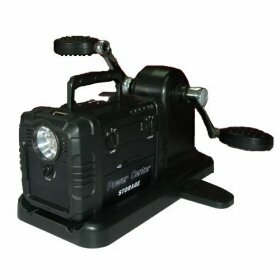 This portable pedal powered generator allows you to generate electricity wherever you go and will power just about anything from mobile phones and iPods to laptops and televisions. Not only is it useful for providing power when mains electricity is not available, it’s great exercise too. So it makes for a healthier planet and a healthier you! It has a three pin plug socket and a built in flashlight for use outdoors at night. To fully charge takes 9 hours cycling at 60 revolutions per minute, though of course you don’t have to charge it all at once. It can also be charged via mains electricity in 7 – 8 hours. It will power a 9 pcs LED torch for 10 hours, a CD player for 4 hours, a TV for 1.5 hours or a laptop for an hour. The Cougar pedal powered charger is available for £99.95. We’ve all been there, you’re on the train, or at the gym, or out walking, and listening to your favourite music and your MP3 battery runs out. Even if you have a rechargeable version that isn’t much good when you’re out and about. Wouldn’t it be great if you could somehow charge up on the move? Introducing the wind up MP3 player; this great piece of kit provides 15 – 20 minutes listening time from just one minute’s winding. It is also chargeable from your PC via a USB cable for up to 4 hours listening time. 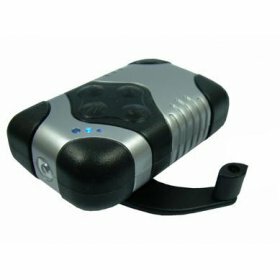 It has an integrated flashlight and mobile phone charger and an impressive 1 gigabyte memory. It is small and rugged and does not compromise on sound quality. At £39.95 this is easily comparable in price to other players of similar quality though without the expense of batteries. This small and sleek multimedia player doesn’t require any batteries – ever! It is charged by natural sunlight, or for overcast days, via a USB cable. It has a 2 inch TFT screen. It has 4 gigabytes of memory and plays music, videos and displays photographs. These are really cool and innovative devices. 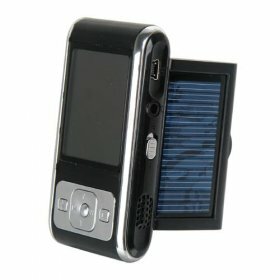 The solar power can now be also access from a smaller devices. They are really great inventions. This tips are very useful. Thank you for posting and i’ll be looking forward for your next post. Good job. These gadgets are very high tech and very innovative. I think a lot of buyers consider durability and easy to use items.